There are nutritional benefits and culinary benefits to keeping dried cranberries bulk supplies in your pantry. Once you find dried cranberries for sale and experience their unique tangy flavor, you’ll want to make them one of your pantry staples. When you buy dried cranberries online, you’re doing something good for your health and your budget. You’re also saving yourself some time. Tossing dehydrated cranberries on top of a spinach salad will make it more tantalizing. Dried cranberries are frequently used in baked goods such as biscotti, cakes, bread and muffins. You can make traditional recipes, such as chocolate oatmeal cookies and brownies, more delicious by adding dry cranberries to the batter. If you focus on healthy eating, your pantry probably contains a variety of dried fruit and nuts that you add to homemade trail mix and granola. Dry cranberry should be one of the dehydrated fruits you always have on hand. Keeping a bag of dried cranberries at your desk, in the car, in your backpack or wherever you stash snacks is a great idea. However, for an even more delicious treat, you might want to take your snack up a level and pack some yogurt covered or milk chocolate covered cranberries. Making bulk dried cranberries a regular purchase will provide you with numerous health benefits. Dried cranberries have no cholesterol, no fat and no saturated or trans fats. They are a low calories snack that contains antioxidants that your body needs to fight infection and inflammation. Studies show that dried cranberries have the same antioxidant benefits as fresh cranberries. 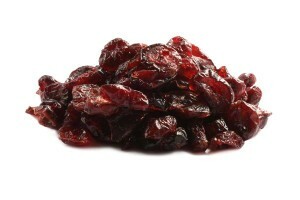 Dried cranberries strengthen your immune system. They also protect against cancer. When you buy bulk dried cranberries you can be sure you’ll have something on hand that can help prevent or ease digestive problems. Dried cranberries are credited for helping prevent urinary tract infection. Dehydrated cranberries can be an important part of a heart-healthy diet. Cranberries are harvested from mid September to early November. There are two ways in which cranberries are commercially harvested. The most frequently used method is wet harvesting. Cranberries are grown in bogs. The process of wet harvesting involves intentionally flooding the bogs so that the cranberries will float to the top when the water is stirred with water wheels. The floating cranberries are lifted into a truck and transported to a receiving station for cleaning. Dry harvesting uses a walk-behind machine to remove the berries from the vines. The berries are collected in burlap bags and delivered to a receiving station to be graded. If you want to dehydrate cranberries at home, be prepared to set aside a considerable amount of time for this project. The process of drying cranberries can be done in an oven or a dehydrator. To dry cranberries in an oven, you’ll need to wash them, put them in a large bowl, pour boiling water over them and let them sit for approximately 10 minutes. This is to allow time for the skins to rupture. The next step is to drain the berries, then sprinkle sugar on them. About 1/4 cup of sugar is recommended for a 12 ounce package of fresh cranberries. Spread the cranberries on a dehydrator tray and dehydrate them at 140 degrees for 12 to 24 hours. If you’ll be drying cranberries in an oven, you’ll need to wash them, put them in a pot, add water and a granular sweetener and boil them for about 10 minutes. Drain the berries and spread them on a sheet pan that you’ve lined with parchment paper. Set the oven temperature to 170 degrees. It will take about 7 to 8 hours for the berries to dry. Dehydrating cranberries at home is time consuming. Buying dried cranberries online is a faster, easier way to stock your pantry with this nutritional, tasty fruit. It’s amazing how many nutritional benefits you gain from snacking on dried cranberries and including them in many of your recipes. Dried cranberries are a good source of fiber. They provide protein, copper, iron, zinc and calcium. Dried cranberries are an excellent source of manganese. Dried cranberries are rich in phyto-nutrients which are consider essential for overall wellness.